I got this buck this morning. Not much of a story I was sitting in my stand and he came in took a trail behind my stand shot him at 10 yards and he went down in 50. Used my Wild Horse Creek Condor with a axis arrow and tree shark. Thats our dog Jesse who likes to go along for the recovery. Love it when a plan works out. Congratulations Caleb! Fine looking buck and you got it with your wedding present bow too. Mike will need that picture for the book. Nice buck and good shot. Congrats! Lutz would suspect you have a mindful of coveted memories that are yours and yours alone. It was too warm and I only saw one good buck while I was up there, but it did not work out. That's a good one for sure !!! My daughter saw your pic and blurted out, "The dog photo-bombed him!" Very nice deer! 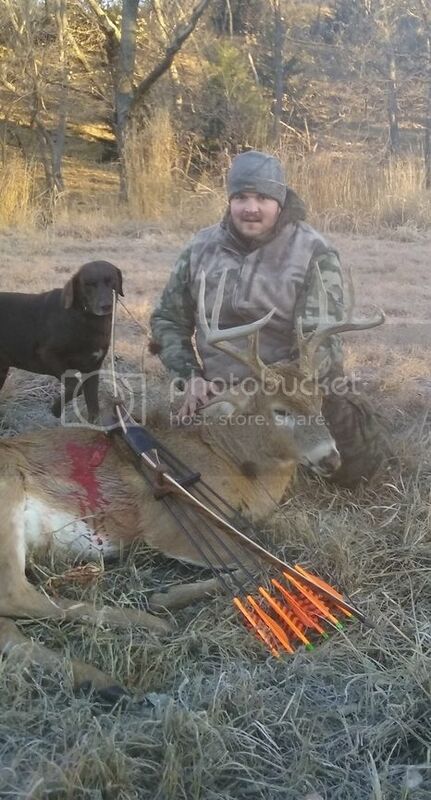 Kansas-made stickbow meets Kansas-made whitetail!